Gorgeous 3BR Home New Hot Tub. Free Internet. Quiet & Private. Bedding Information: 1 King. 1 Queen. 2 Singles. tub/jacuzzi in a private garden setting. high speed Wi Fi access to the Internet. courts, and all the amenities of upscale resorts. the water all year round and fantastic snorkeling! a pleasure. Next time we'll bring the whole family." Susan & Daniele L.- Melbourne, Australia. on the Lookout deck and dinners on the lanai. had in the closet. Mahalo." "The house worked out great for our family reunion. Free high speed WiFi Internet access. 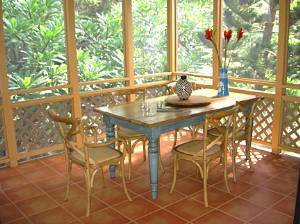 Screened-in LANAI, perfect for romantic dinners high in the treetops! King size bed with balcony access to garden. 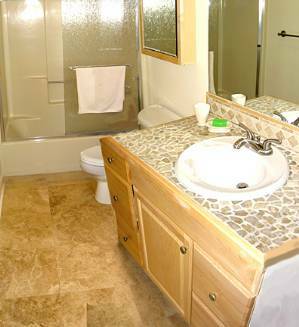 Also includes Master bathroom. Queen size bed with garden access. 2 Twin beds in the third bedroom. Beautifully tiled and newly renovated. Ocean and mountain view lookout deck on top of house. Just wanted to send you a little note telling you how we much we enjoyed staying at your home. 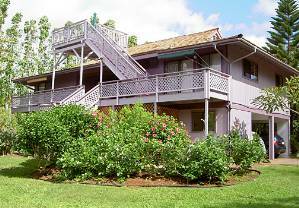 After having heard the road noise from our hotel rooms on Molokai and being woken up at 2am by the chickens, waking up on our OWN time in those heavenly beds to the birds singing was wonderful! I personally LOVED the hammock. I am thinking about trading in my bed for a hammock. 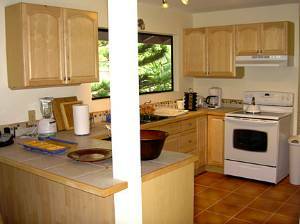 I know I will be telling anyone who is interested in renting a house on Maui about our experience in your house. Everything was wonderful! "My husband and I could feel the caring you put into your house. Very well done and beautifully decorated. We both enjoyed our stay and the kids enjoyed the big yard. We even played some of the board games you had in the closet. Mahalo." 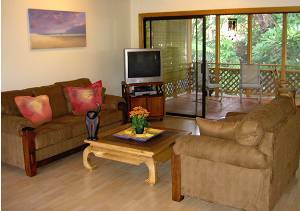 "Wonderful, beautiful relaxing place, we loved the dining experience of the screened in Lanai, being high in the treetops! The spaciousness of the home was also a pleasure. Next time we'll bring the whole family." Above rates for 1-4 guests. Additional guests...$15/nt. 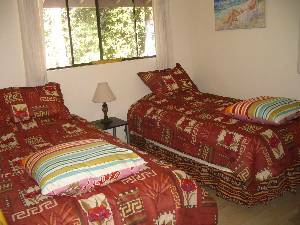 each Maximum Occupancy: 6 Persons For stays less than 5 nts. will add $200 cleaning charge. 28 days or more...10% discount off weekly rate. Cancellation Policy: If 30 days before arrival, Full Refund. Less than 30 days, refund only if we can re-rent it. Then, less $25 service charge. All rates subject to 11.42% V.A.T. Other Fees: $30 for each extra guests (maximum 6 guests).